The Honeywell PD43/PD43c is a further stage of the successful label printers PD41 and PD42. Thanks to both its metal housing and print mechanism the printer delivers robust performance and impresses with its incredible compactness. Handling and longevity are increased as a result of its tools-free replaceable print head and platen roller. The printer remains customizable even after its purchase easily equip it with a 300 dpi print head, cutter or peeler at any time. The PD43 supports label rolls in various core sizes 1, 1.5 and 3 and ink-in and ink-out ribbons in lengths up to 300 m. The PD43 runs apps right inside the printer, yet it is ultra compact. A print speed of up to 200 mm per second at a resolution of 203 dpi will impress. The color display controls local applications directly, making it easy to use. Either C or Fingerprint is available for programming interfaces. 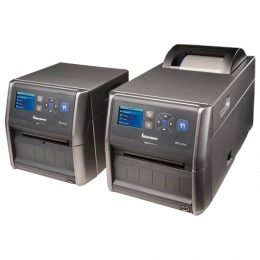 Even connect a scanner directly to the printer - there is no need for a host system, which consequently reduces costs.